Imagine a moon where your typical view is the gargantuan planet Jupiter. It never seems to move across the sky and just stares right back at you. This is probably a typical view from most of the moons around Jupiter but there is one that separates itself from the rest; enter Callisto. Callisto is a very intriguing planet when you start getting a closer look at it. 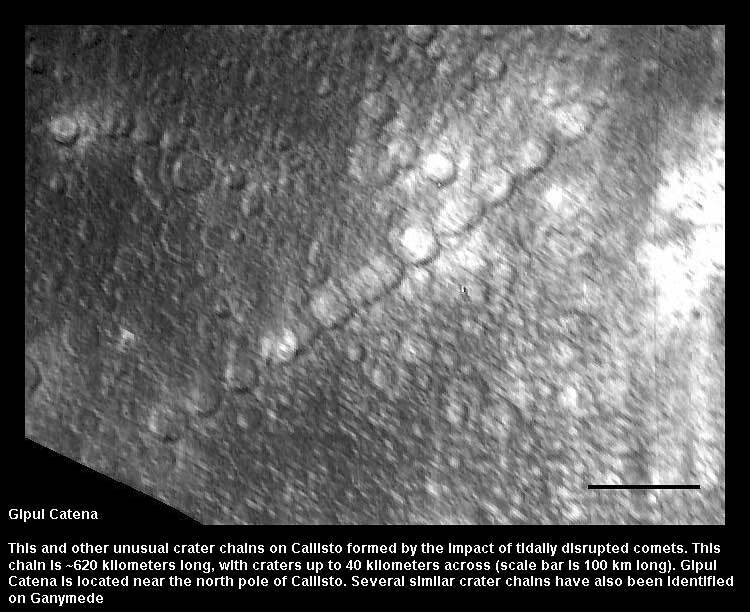 Its cratered filled surface tells a story of ancient turmoil since the early solar system. We know that its other comparable siblings – Io, Europa, and Ganymede – experiences tidal heating as a result of orbital resonance. 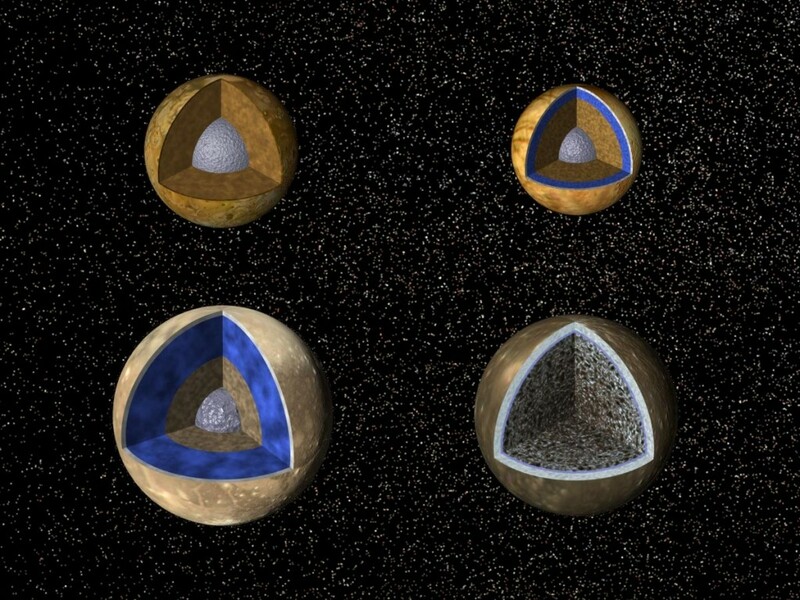 Meaning the enormous effect of a tug of war between Jupiter’s gravity and these moons causes some internal heating. However, Callisto is not within this effect and does not have any tidal heating. Watch closely when the planets align. Their gravity plays a push and pull effect on each other as well as with Jupiter. 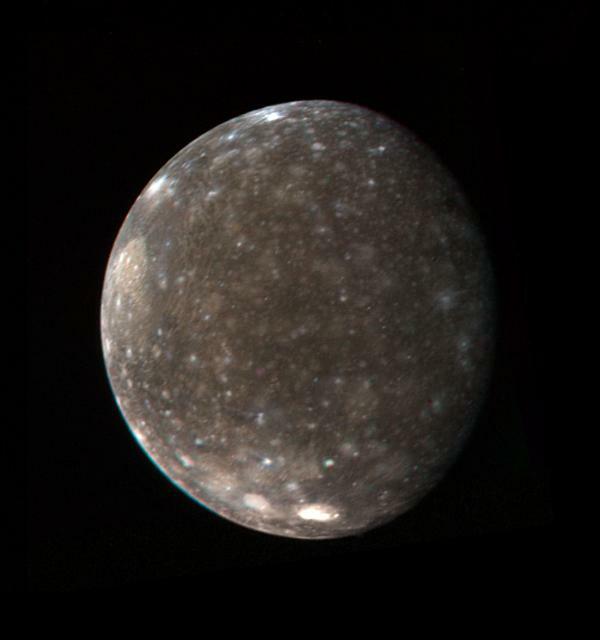 Looking at the surface of Callisto it appears to have equal parts rock and ice. The gravity on Callisto would even be less than our own moon. 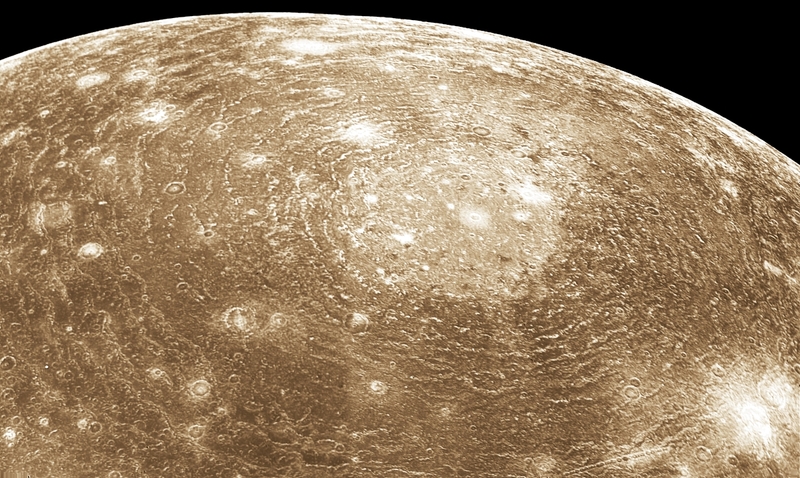 Callisto does show signs of ice water on the surface, meaning there are chances for microbes to be in the water, albeit not a great environment to thrive in. There isn’t any geologic activity such as volcanoes or tectonic plates. The temperatures on Callisto are about -171 degrees C, which means you may need more than an incredible jacket to survive those temperatures! Let’s take a look at one of the most devastating impacts on Callisto, Valhalla. You can see impact rings in the photo above was caused by a highly disruptive massive impact. The inner impact ring (bright white region) is about 360 km across and the rings extend out to a whopping 1,800 km! The bright spots are thought to be water frost deposits and the darker areas are usually in the lowland which exhibit smooth features. Starting with the top left we have our friend Io with its iron core, silicate crust and molten silicate interior. Then on the right of Io we have the infamous Europa. It also has an iron rich core, silicate mantle, thin ice crust, and possibly a subsurface ocean, which is one of the many reasons why Europa is very intriguing. Moving to the bottom left we have Ganymede with a possible partial molten iron core as well as a silicate lower mantle, icy upper mantle, and an ice crust like Europa. Finally, we have Callisto with no iron core but an interior with a mix of ice-rock and an ice rich interior. It’s amazing to see how Callisto is very different from the other 3 siblings. 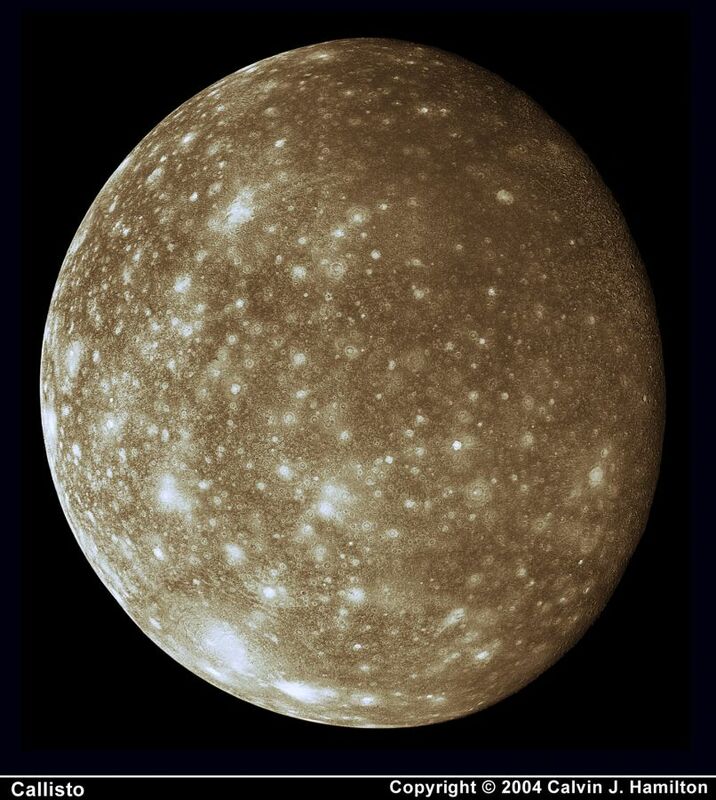 Scientists do not have any direct evidence, but estimate from the craters left on the surface that Callisto may be as old as our solar system! 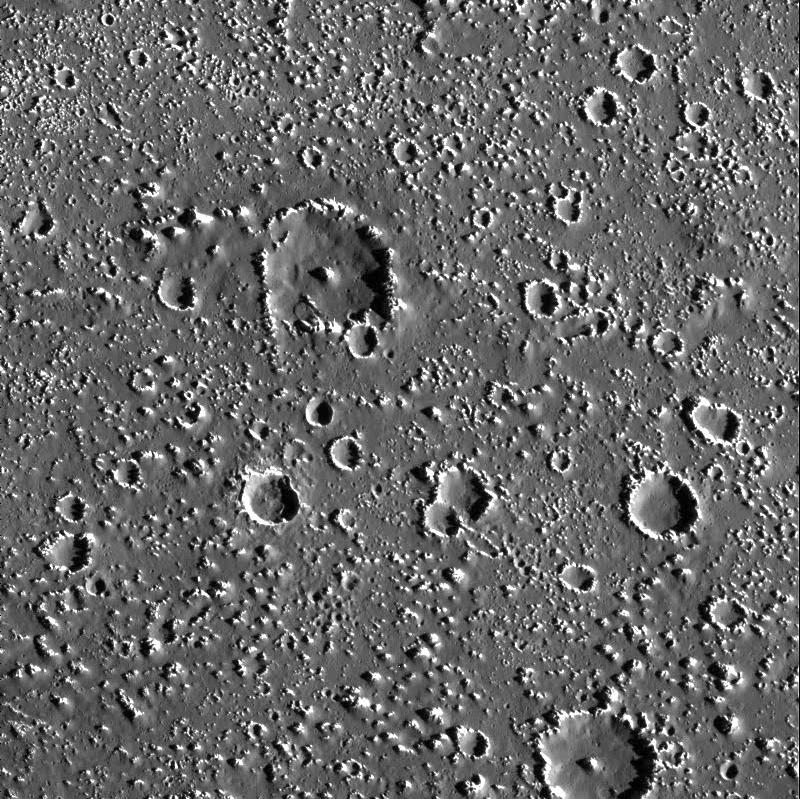 Moving on to a famous string of impact craters on Callisto called the Gipul Catena. This string of impacts is about 620 km long and is thought the object broke up in pieces as it was approaching impact. Scientists have seen similar patterns on Ganymede as well. These two moons get bombarded on a daily basis by many pieces of rock and meteorites. Another interesting fact about Callisto is since it has low radioactivity that some scientist think it’s a contender to set up basecamp for humans. It may serve as a “rest stop,” if you will, where astronauts can use to explore Jupiter or the rest of the solar system. The future is definitely exciting for space exploration and I cannot wait to see what mysteries will be uncovered in the near future. Check out how Jupiter's moon Callisto exhibits the strangest features as well as a possible basecamp for future human exploration.